Our 2009 holiday rides for the Festival of Lights celebration around the Mission Inn in Downtown Riverside, CA were a huge success. We’ll see you in 2010. Reserve our whole carriage for a private ride for you and your family. Just walk up and get right in at your reserved time. There are no bars or lights over your head on our carriage to obstruct your view of the beautiful historic downtown buildings and famous light displays. Where? TBA MAP Make sure you find Martini Ranch Carriages. We have over 20 years of experience and a PERFECT safety record! When? Carriage rides begin on Saturday, November 29th, 2010 and go until Sunday, January 4rd, 2011. How to reserve our carriage: Email n2horsn@aol.com or call 951.739.7669 or 951.809.7669. Due to the high volume of calls and the late hours we could return your calls, email is the best way to contact us. How many people can fit in our carriage? 4 t0 8… we have two 43″ seats for passengers and small children can ride on your laps. There may be room for one or two children to ride with the driver. How long are the rides? We have a 15 minute ride and a 30 minute ride. The half hour tour takes you through the well lit Historic District homes and back by the Mission Inn. Parking is available on most streets. We recommend parking behind Gram’s BBQ on Market between 5th and 6th. It’s FREE after 5PM. Arrive EARLY as it can be difficult to find a spot, especially on weekdays. What else is there to do downtown? Walk around the Downtown Mall on Main St. towards 10th st. You will find vendors offering ice skating, cinnamon bread, roasted nuts, light up toys, Santa Claus and much more. 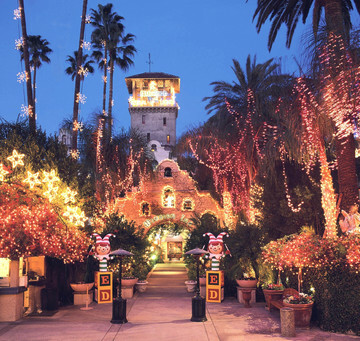 Your family can walk right inside the Historic Mission Inn to see their holiday displays. Martini Ranch Carriages was just awarded the Best Place to Propose in Riverside County by the readers of the Press-Enterprise. Everyone says ‘YES’ in the carriage! See our elegant horse and carriage bring Jennifer in for her Grand Entrance in the lovely video. Martini Ranch Carriages takes the Baron of Koroneburg and his guests, the Queen and King of Spain, on a VIP ride at the Koroneburg Renaissance Festival in Corona, CA. Come and ride in our carriage with your family. Children under 5 are free. For more information on the Renaissance Festival see http://renaissanceinfo.com. You can even download discount tickets there. The festival is going on until June 14th. 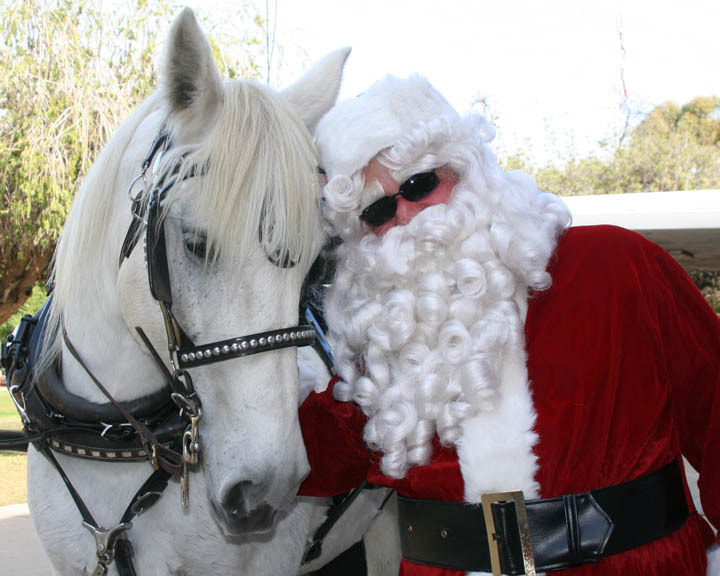 For the past several years Martini Ranch Carriages has had the honor of delivering Santa and Mrs. Claus to the children at CSDR (California School for the Deaf in Riverside). We bring them all through their Silent Sleigh parade route in style. Then Santa signs with the children to find out their holiday resquests. I would really like to know what our horse, Molly, asked Santa for this year. We’ll be taking the Norco Royal Court up the parade route for the Norco Chamber of Commerce. This is a fun parade to watch because its at night, no motorized vehicles are permitted, there are lights all over the horses and wagons and there is SNOW, food and festivities at the end of the parade!